I find nothing more gross than vegetable dipped in ranch dressing. Yes, anything remotely highly processed and unnatural has no room in my kitchen! Plus, the only thing that it does is add more "empty" calories to one's diet. So let's talk about a healthier way to snack. Hummus is a great way to add a lot of needed nutrient to our diet without compromising taste and adding those empty calories. Hummus is versatile as well as it can be used as a base for sandwiches or as a dip. It truly only takes 5 minutes to make this delicious condiment, so no need to get pre-made one with all those artificial flavors and/or preservatives. 1- Put everything in a food processor and begin to process. Add chickpea liquid as needed until you have the right consistency (not too creamy but not too liquidly). 2- Taste and adjust the seasoning. Place in a container, sprinkle a bit of paprika on top and drizzle some olive oil. Keep in a fridge for about a week or so. It's that time of the year...The weather is getting cold and a warm & hearty soup is always welcome. I like making large quantity of soup at one time and then keep it for the week or freeze some for later. 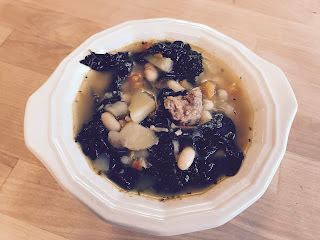 Try this kale, bean, potato and sausage soup - simply delicious, hearty and healthy! Sautee the yellow onion in about 2 tbp of olive oil until translucent. Add the garlic, carrot and spices (cumin, red pepper flakes and paprika) and stir in for another couple of minutes. Add the sausages and cook until they are browning. Add the potatoes stirring for another minutes and coating them with all the other ingredients. Finally add the beans and the liquid, salt, pepper, thyme and ensure that all ingredients are covered. Bring to a boil and simmer for about 1 hour to 1.5 hour or until the beans are cooked. Taste and adjust flavor with additional salt/pepper, spices if needed. Remove about 1 to 2 cups of the soup (minus the sausage bites) and smash it. Add back to the soup (this will give a creamier texture to the soup). 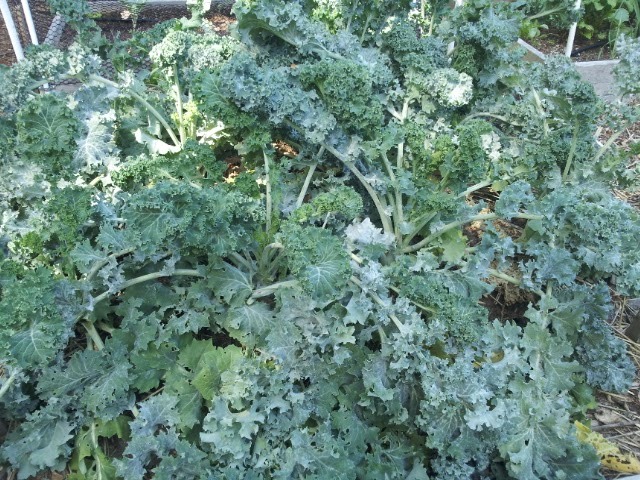 Add the kale and simmer until wilted. Serve with slices of bread and sprinkle with some fresh gated parmesan. After you realize how easy making mayonnaise is, you will never want to buy pre-made mayonnaise again! It only takes two minutes to make the freshest and preservative-free mayonnaise. It only takes 3 ingredients, a hand blender and 2 minutes! Put all ingredients together in a bowl or mixing container, add salt and pepper to taste, blend for about two minutes. And you are done! You can keep the mayonnaise in the fridge for up to 2 weeks. Want to make aioli? Simply add a crushed clove of garlic and substitute neutral oil for olive oil! One of my favorite's childhood cakes is the "Gâteau au Yaourt" or yogurt cake. It is certainly due to its simplicity and easiness to make. It is a great cake to make with children and it is sure to delight everyone. It can be served as a dessert, afternoon snack or birthday cake. It can be dressed up with a chocolate drizzle, glaze, served with strawberries or just kept plain. Preheat the oven at 350F. Butter a baking pan, round or rectangular is fine (I like the shape of the coffee cake pan). Pour the yogurt in a mixing bowl and add the other ingredients in the following order, use a a whisk or wooden spoon to mix - sugar, vanilla or lemon zest, eggs (one at the time), flour, salt and butter (or oil). Pour the mixture into the pan and bake for approx. 45-50min. let it cool down prior to removing from the pan. of water and 1/2 cup of white wine. Simmer until most of liquid has evaporated. Transfer bean-onion mixture to food processor, add ¾ cup cooked quinoa, and process until smooth. Transfer to bowl, and stir in remaining ¾ cup quinoa and remaining ¾ cup black beans. Season with salt and pepper, if desired, and cool. Preheat oven to 375°F, and generously coat baking sheet with cooking spray. 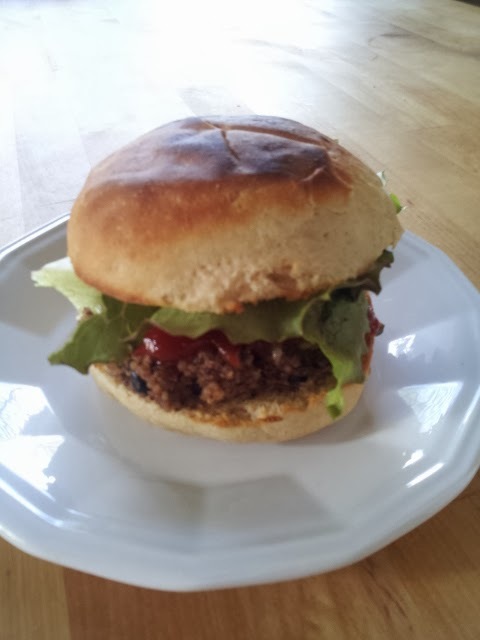 Shape bean mixture into 8 patties, and place on baking sheet. Bake 20-30 minutes, or until patties are crisp on top. Flip patties half way through until both sides are crisp and brown. Add some shredded cheese on top of the patties for the last 1-2 min. Serve patties as a "regular" burger. Also, a chipotle sauce would add a nice spicy flavor to it. Let rest for about 30 min to 1 hour. a ball. Place 3 in. apart on greased baking sheets. or until golden brown. Remove from pans to wire racks to cool. 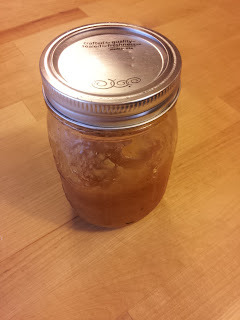 This year, I had given up the idea on making peach jam. I usually get a huge box of peaches on my way back from my in-laws, in Eastern WA. This time, it must have been too early, we stopped by the fruit stand but they did not have the boxes of peaches ready. I was disappointed but on a way, since I was due to deliver my baby anytime, maybe it was a good thing not to have additional chores. I came to term that I would not enjoy any delicious peach jam during winter. Little did I know that a few weeks later, my mother in-law, who was coming to baby sit her grandchildren for an evening, would surprise me with a box of peaches! 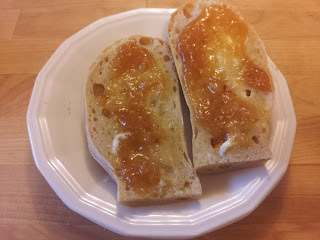 I was back in business...I could already taste the jam on my homemade bread...mmm. I used approx. 32 medium to large peaches and yielded 11 quart jars of delicious peach jam. After getting my peaches ready (blanched, peeled and pitted - by the way my chicken loved the peels! ), I put all the peaches, sugar, lemon juice and Cointreau (optional, but again, why not?) in a large pot. I bring everything to a boiling point and leave it that way for about 5-7 min, then I reduce the heat to low and cook the jam for about 30 min or so. The easiest way to find out if the jam is ready, is by using a plate that has been in the freezer and by placing a spoon full of the jam on it. If the jam does not run off, it is ready! The next step is to can the jam, first ensure to sterilize all the jars and lids. Once that step is done, fill the jam in each jars and place the lids on the jars. Put the jars in a boiling pot of water (ensuring the water covers the jars completely) and let it boil for about 5 min. Remove the jars from the water and let them rest on the counter for 24 hours. This is that simple...Not pectin and only natural ingredients. Great to enjoy with yogurt, toast, pancakes, and anything else you may think of! They make for good presents too. I am a big fan of pesto, but do not like to stick to the only kind of pesto most people know, basil pesto. Being a huge fan of kale as well, I had of course, to make other kind of pesto. 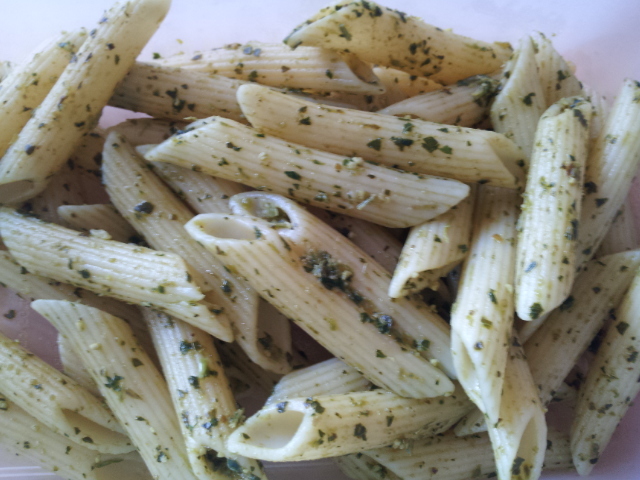 Here are a couple of pesto I like to make to enjoy on pasta, pizza, sandwiches or anything else I can think of. Blend everything in a mixer, adjust the amount of olive oil to make a smooth paste, it should be thick enough but not too much and liquidly enough but not too much.